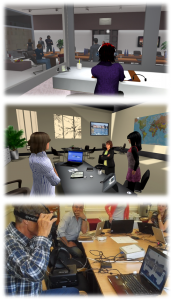 The Interpreting in Virtual Reality website presents two EU-funded projects: Interpreting in Virtual Reality (IVY) and Evaluating the Education of Interpreters and th eir Clients through Virtual Learning Activities (EVIVA). Addressing the needs of future interpreters and users of interpreters in higher education, vocational training and adult learning contexts, the IVY project uses the exciting features of 3D virtual environment technology to create an adaptive 3D virtual environment that supports the acquisition and application of skills required in interpreter-mediated communication. EVIVA evaluates the educational opportunities that three types of virtual learning environments — 3D virtual worlds, videoconference- and video-based environments — offer for future interpreters and their clients. Click on the logos below below for more information about the projects. The EVIVA project is now complete! All EVIVA Reports and other Resources are now complete and available for download. In order to consult them, click here or access the Resources tab via the navigation pane on the left.